Language learning seems to be easy for the little one, she picks it up so quickly, it amazes me and fill me with joy everyday. We are currently staying at relatives where we speak a mix of French and Flemish so I assume it would be quite confusing. 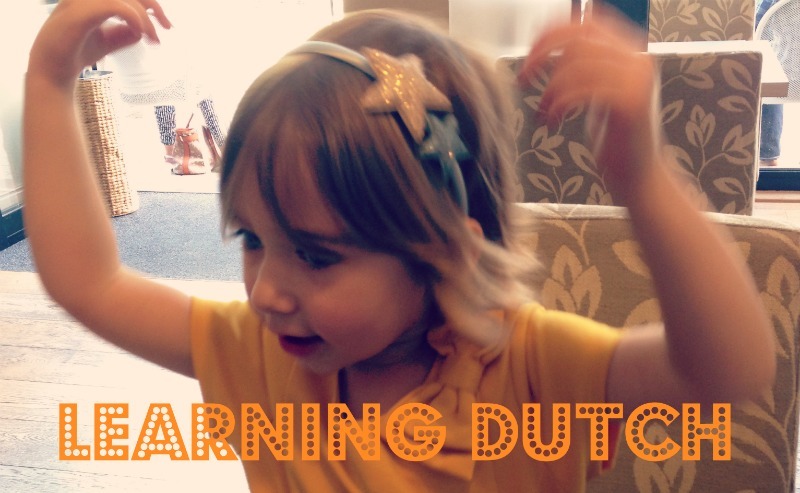 She is going to school 15 hours a week at the moment (2x5h) in Dutch and I speak a mix . In the first week in Belgium I thought her the essentials to survive in school: good morning, I need a wee, poo, thirsty, hungry, thank you and please. Everything else she has picked up along the way. 2 weeks later she is clearly understanding basic Dutch and is replying in English. She will sometimes say a word in Dutch to amuse us or ask in English for a Dutch translation. Pointing to things and showing off certain words. Forth Week: Confident enough to talk back! In the 4th week I noticed a massive difference, she was trying to use Dutch words in several conversation and only adding English here and there. When playing I notice she sometimes speaks little Dutch sentences. The downside is that now she will also talk back in Dutch already. in General she is very bossy at the moment but that’s for another post. the forth week also gave the 100 word mark and thus time to make this post. When she was learning English geeky as I was, I listed the words she was saying as we go, so in order to keep tradition and for applauding her achievement I am listing her first Dutch words here as well. It is especially striking to compare the lists and see the difference in life view and what occupies the girl’s mind. And that’s not all today she showed us that on top of the Dutch she also understands French. When my aunt, uncly and myself speak in French at the dinner table she suddenly started replying in English. There goes our secret language to discuss what she should not hear. Because when we mention the desert before her plate is finished, she is so stubborn she will not continue eating. We were talking about ‘le plat au fromage’ (cheese platter) which would come after dinner and she started shouting ” cheese for me PLEASE “! On top she knows basic formalities in French to now. Hm if we are on a language learning roll, maybe I should consider living in another country every 3 months ;) ! Fantastic progress, it just goes to show how quickly little minds can pick up new skills. Your secret language is defintely no more!